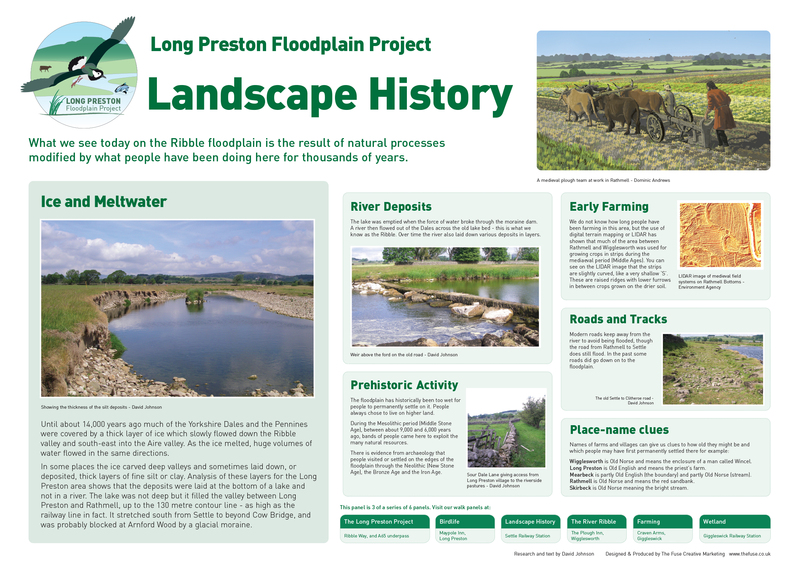 What we see today on the Ribble floodplain is the result of natural processes modified by what people have been doing here for thousands of years. 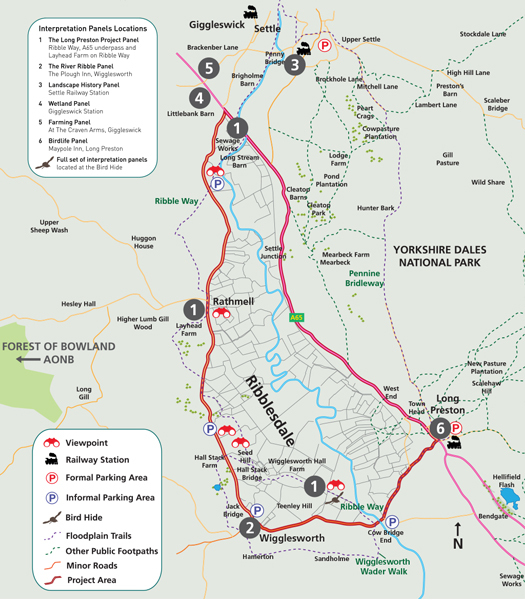 Until about 14,000 years ago much of the Yorkshire Dales and the Pennines were covered by a thick layer of ice which slowly flowed down the Ribble valley and south-east into the Aire valley. As the ice melted, huge volumes of water flowed in the same directions. In some places the ice carved deep valleys and sometimes laid down, or deposited, thick layers of fine silt or clay. Analysis of these layers for the Long Preston area shows that the deposits were laid at the bottom of a lake and not in a river. The lake was not deep but it filled the valley between Long Preston and Rathmell, up to the 130 metre contour line - as high as the railway line in fact. 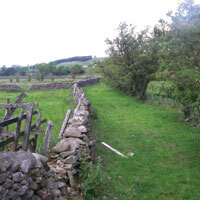 It stretched south from Settle to beyond Cow Bridge, and was probably blocked at Arnford Wood by a glacial moraine. 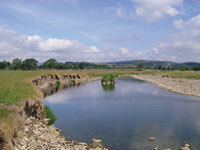 The lake filled the Ribble Valley between Long Preston and Settle. The lake was emptied when the force of water broke through the moraine dam. 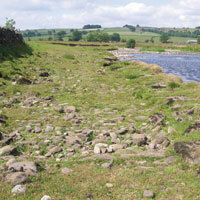 A river then flowed out of the Dales across the old lake bed - this is what we know as the Ribble. 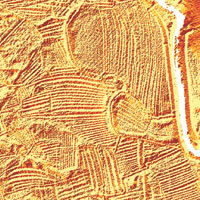 Over time the river also laid down various deposits in layers. The floodplain has historically been too wet for people to permanently settle on it. People always chose to live on higher land. During the Mesolithic period (Middle Stone Age), between about 9,000 and 6,000 years ago, bands of people came here to exploit the many natural resources. 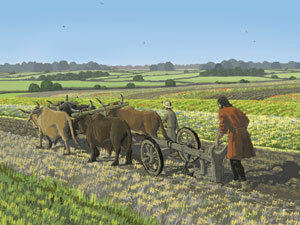 There is evidence from archaeology that people visited or settled on the edges of the floodplain through the Neolithic (New Stone Age), the Bronze Age and the Iron Age. We do not know how long people have been farming in this area, but the use of digital terrain mapping or LIDAR has shown that much of the area between Rathmell and Wigglesworth was used for growing crops in strips during the mediaeval period (Middle Ages). You can see on the LIDAR image that the strips are slightly curved, like a very shallow 'S'. These are raised ridges with lower furrows in between crops grown on the drier soil. Modern roads keep away from the river to avoid being flooded, though the road from Rathmell to Settle does still flood. In the past some roads did go down on to the floodplain. Wigglesworth is Old Norse and means the enclosure of a man called Wincel. 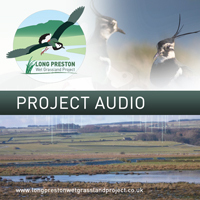 Long Preston is Old English and means the priest's farm. 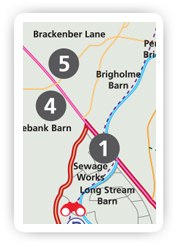 Mearbeck is partly Old English (the boundary) and partly Old Norse (stream). Rathmell is Old Norse and means the red sandbank. 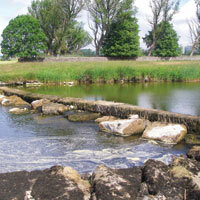 Skirbeck is Old Norse meaning the bright stream.